Inflatable boat PVC glue is a use-friendly repair adhesive. This product has excellent adhesion to Polyurethane and Hypalon coated fabrics. 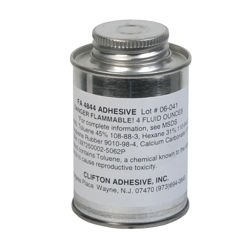 Hypalon glue has been used with great success in the inflatable industry for use as a repair adhesive. This product has excellent adhesion to Neoprene and Hypalon coated fabrics. It is very user friendly. Bond development is fast and this adhesive is of choice amoung inflatable boat and river rafters.